The secret to winning the SEO game is not to play. 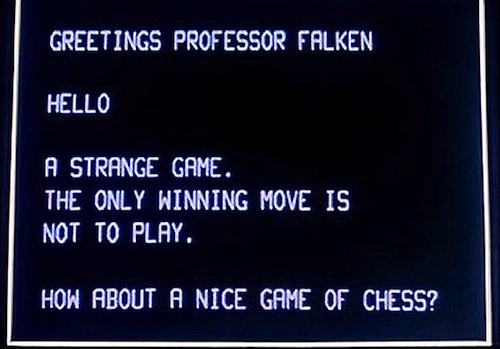 When it comes to Search Engine Optimization I’m reminded of that scene from the movie War Games with Matthew Broderick. If you haven’t seen it yet it’s about how a kid hacks into the USAF mainframe and finds games which include Chess, Poker, Desert Warfare, and Global Thermonuclear War. Of course he chooses Global Thermonuclear War because who doesn’t want to play that game. He ends up starting the launch sequence for our nukes and gets arrested by the government. He cleverly escapes and finds Professor Falken who wrote the program. They end up un-doing what he did and save earth from World War III. Does This Sound Like What’s Happened In SEO The Past Three Years? SEO gurus gaming the Google algorithm by finding out how to get their sites ranked higher to only get their sites blown up when Google dropped the Panda, Penguin, and most recently Hummingbird updates. Everybody went into full panic mode trying to un-due the past couple years of work to save their site. I’ve been doing internet marketing since 2008 and have had a lot of success. When I first started building websites there was little mention about SEO from the people I followed. Most of what was being taught then focused on creating exceptional content and clearly defining what your site was going to be about. Along the way I kept getting notifications of SEO courses and best SEO practices from followers of the internet marketers I followed. Before I knew it I was spending so much time trying to learn and apply these additional techniques from 2011 and on that I didn’t realize I was making a cardinal mistake in internet marketing. I had stopped creating content. The one thing I kept on hearing over and over from all of these SEO wizards was the need to optimize posts and pages so Google could figure out what my site was about. What I forgot to realize was the sites I had already built were ranking on page one or two in Google for a bunch of high trafficked keywords at the time without following any of these latest and greatest SEO techniques. Bold this, underline that, keyword density % this, H1 and H2 and H3 usage this, begin and end your post with your keyword that. It was turning me into a robot. If I was trying to recommend products to robots then I was well on my way to ridiculous fortunes. Unfortunately, it was people who were my demographic and what they needed was well researched content delivered in a way that answered their questions. I focused so much on optischmizing for Google that I forgot about connecting with my peeps. Listening to what the smart people were saying set me back a year or two in the growth of my business. Probably spent $2k on “traffic getting courses” and SEO WordPress plugins during that time. None of them improved any rankings of mine. It never occurred to me to see if these people had sites that were ranking for terms that actually made money. Before I started *learning* SEO from these people I was nearing 6 figures in earnings my second year by only creating content. If anything I should have been teaching them. Many of my sites that I went back and optimized to the SEO guru’s standards took major hits in search engine rankings. I’d say up to 50% traffic loss in a year. What’s funny is a number of my small niche sites that I didn’t get around to optimizing per the guru’s standards were not affected at all. How could this be? Like SEOMoz or a number of other high-profile SEO pros but what is it that they really do? Well, their trying to sell you tools and services that *they think* will help you rank your site better in Google, Yahoo, and Bing. What’s funny is when you see an article on one of their sites saying some SEO tactic that used to work is no longer working. Every time a new SEO course or service is released you can bet somebody at Google has bought the service and tracked the results on a dummy website they run. They backtrack what was done to artificially rank that site and determine if those tactics deliver the best results for Google users. From there they go back to the über secret Google algorithm and tweak it ever so slightly to make sure those tactics don’t work as well or at all anymore. Wouldn’t you create fake accounts on BlackHatWorld.com or SEOMoz and stay up to date on what people are trying to do to game your system? I would. The gaming of search engines is a flawed business model. If you’re betting on building a long-term sustainable online business by gaming Google then let me be the first to tell you that it’s not going to happen. And to be honest, its tiring. You and I do not work for Google, Yahoo, or Bing. Why is it that the search engines don’t come out and say exactly how to rank a site in the #1 spot for any keyword? My best guess is they want to rank for the #1 spot for all (money) keywords. Go to Google right now and type anything in. Notice how the first two or three results are Google Ads along with the five or six running down the right sidebar? So in all actuality Google is ranking #1-#3 for your keyword and there’s nothing you can do about it. Correct that. You can be #1 if you’re willing to pay for it. After reading just about everything you can in regards to SEO I find myself just about right where I started when it comes to building websites on the *hope* of getting most of my traffic with search engines. Write good content for people. Not search engines. Title your images with your keyword. Clearly define what your site is going to be about. Write great titles with clear descriptions. Link to your best posts and others too. Connect with other sites in your niche and ask to guest post. Those are the best SEO secrets I have learned. It’s so easy to get bogged down with info over load from the SEO guru’s that you might lose track of why you started the site in the first place. I’d advise not looking into it too much until Google comes out and tells the world how to rank #1. My best guess is it’s never going to happen. This is about right. Surprisingly accurate post Brad considering SEO isn’t your real forte. I’ll add to this post that the main problem in SEO is its a massive pot of misinformation. Gurus galore saying XYZ is the way to rank. Unfortunately, you can’t trust anyone – only trust your rank tracker. To make things worse, Google is the real puppeteer of the industry, and SEOs are direct competitors to their bottom line (PPC). Naturally, Google is trying to weed out SEO as a professional service and shift most of the market to PPC instead. It takes a lot of experience and will-power to continue to pull big rankings today, and anyone who is good at SEO sure isn’t sharing any secrets for cheap. That’s the rule of thumb right there – any SEO who is worth their snuff is usually too busy doing projects on their own and making money – not blogging about the latest SEO tactic or selling some cheap SEO package.